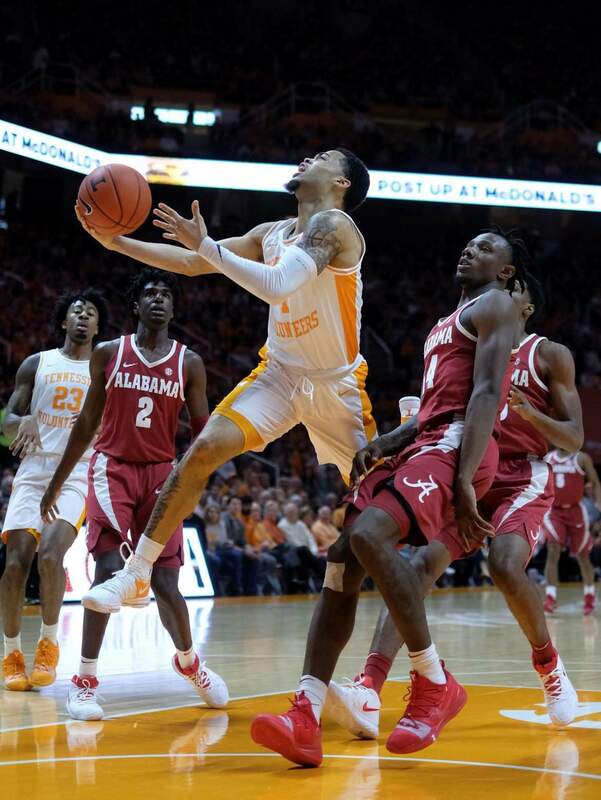 Tennessee guard Lamonte Turner attempts a shot against Alabama forward Tevin Mack in the first half of Saturday’s game in Knoxville, Tenn. Tennessee won 71-68. Tennessee guard Jordan Bone (0) reacts from a foul made by Alabama in the second half of Saturday’s game in Knoxville, Tenn. Tennessee won 71-68. Top-ranked Duke went down early in the week. No. 2 Michigan and No. 4 Virginia, the last of Division I’s unbeaten teams, both fell over the weekend. In all, six top-10 teams lost. The Vols are the new No. 1 in The Associated Press men’s college basketball poll on Monday, climbing three spots to earn their first top ranking since the 2007-08 season. “The guys playing right now built this thing,” Tennessee coach Rick Barnes said. 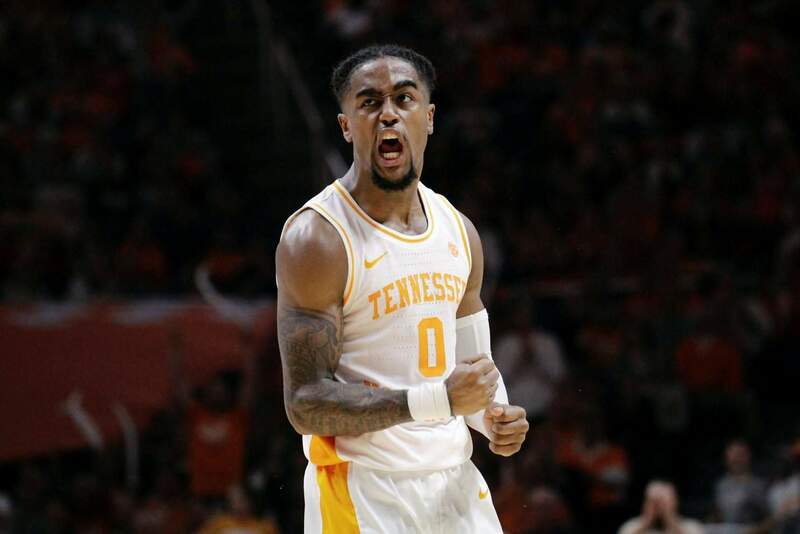 Expectations followed the Vols into the 2018-19 season. With its top six scorers back from a team that shared the SEC title, Tennessee had its highest preseason ranking at No. 6 and was eyeing a deep NCAA Tournament run in Barnes’ fourth season. The Vols have lived up to the forecast so far, bouncing back from an overtime loss to then-No. 2 Kansas to win 12 consecutive games. Tennessee knocked Gonzaga from atop the AP Top 25 with Barnes’ first win over a No. 1 team in early December and won its two games last week, rolling over Arkansas and holding off Alabama. The only other time Tennessee (16-1, 5-0) was No. 1, it lost the next night to Vanderbilt – the Vols’ opponent on Wednesday. KENTUCKY RISINGKentucky saw a steady slide down the AP Top 25 after opening the season with a blowout loss to Duke. The preseason No. 2, the Wildcats were down to No. 19 just a month ago, but started climbing again. RISING AND FALLINGNo. 13 Maryland moved up six spots after beating Wisconsin and Ohio State. MOVING INLouisville moved into the AP Top 25 for the first time this season at No. 23 following wins over Boston College and Georgia Tech. Iowa State’s wins over Texas Tech and Oklahoma State put the Cyclones back in at No. 24 after they dropped out from No. 20 last week. MOVING OUTOklahoma joined Florida State in dropping out of the poll following losses to Kansas State and Texas. The Sooners were No. 20 last week.